Whenever I asked a Chinese person what I should do for the national holiday, they immediately suggested Lijiang or Dali. Then they followed that up with, “But it will be very, very crowded.” Pretty much anywhere during the holiday is crowded. The national week holiday is one of China’s two “Golden Weeks” where a large portion of the population goes on vacation, resulting in one of the world’s largest mass migrations. One article said that 840,000 busses would be on the roads to deal with the increase in passengers. 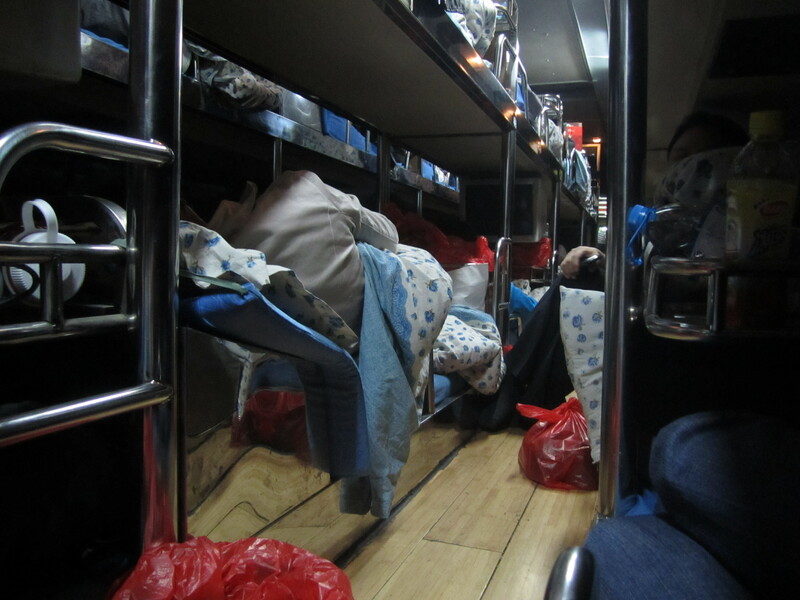 I was one of those passengers, on one of those busses, headed for one of the most touristy cities in Yunnan Province. Wonderful! Despite my sarcasm, it actually was a wonderful vacation. I was traveling with my friend and co-worker Dan, who is very easygoing and a great person to travel with. I knew it was going to be a good trip when we snuggled into our beds on the overnight bus. It felt like the beginning of an exciting adventure, and I was prepared with my earplugs, snacks and water bottle. (I say snuggle because it was a tight squeeze. The bed was not much wider than my body, and your feet get stuffed into a compartment that is the headrest for the person in front of you. Plus I had my pack with me in my bed because I heard that theft can be a problem on overnight busses…) Tucked under my comforter, I thought that the bed, despite being cramped, was actually pretty comfy. About an hour after we set off from Kunming, the driver turned on some quality entertainment (aka 80’s Jackie Chan kung-fu movies). 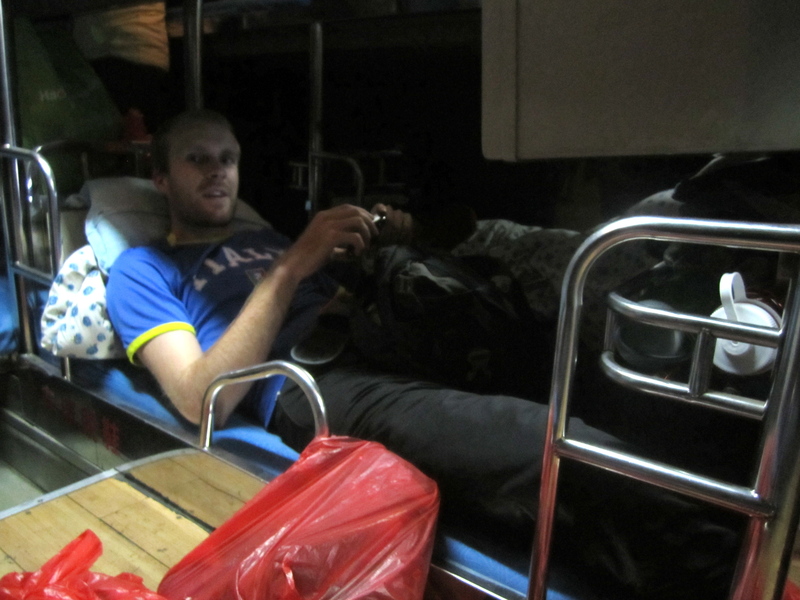 Dan was lucky enough to have a TV set right in front of his bunk, and even with an eye mask and earplugs, the volume and flashing fight scenes were out of control. I have no idea how the Chinese grandma next to him was sleeping. Luckily, after two movies and several potty breaks, the movie portion of the trip concluded and I was able to catch some z’s. Dan said he tossed and turned, but couldn’t really sleep. We arrived in Lijiang at 6 am, slightly delirious and sleep-deprived after the bumpy bus ride. 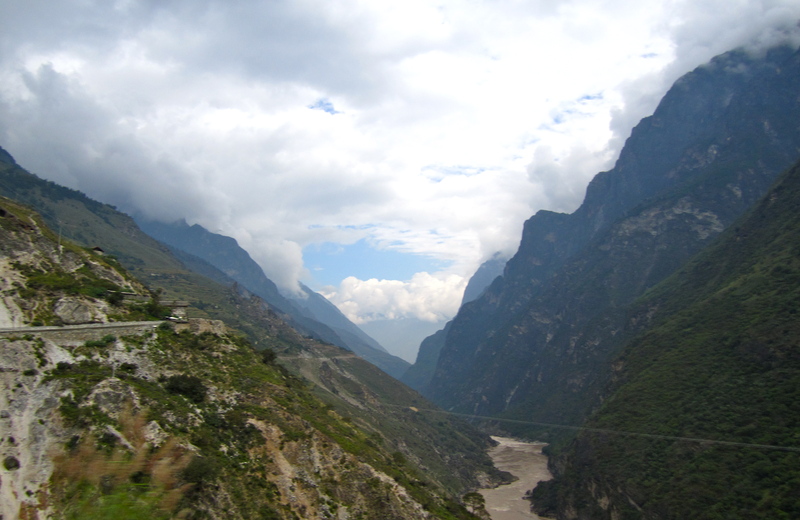 The driver let us sleep on the bus for an hour until 7 am when the bus station opened and we could get our tickets to Qiaotou, where we’d begin our Tiger Leaping Gorge trek. On our minibus from Lijiang to Qiaotou, we met a group of six or seven other American teachers and ended up hiking the first day with them. With a large group, everyone was able to hike at their own pace, which meant that Dan was at the front, practically running, and I was in the middle chugging along slowly but surely. The last group of girls got lost a few times! It was beautiful to take in the scenery, and the trail was great. We hiked for about five hours, with a few stops to catch our breath and take pictures. I’ll let the pictures explain the rest. There's the gorge. The weather was a little cloudy, but great for hiking-- not too hot, not too cold. 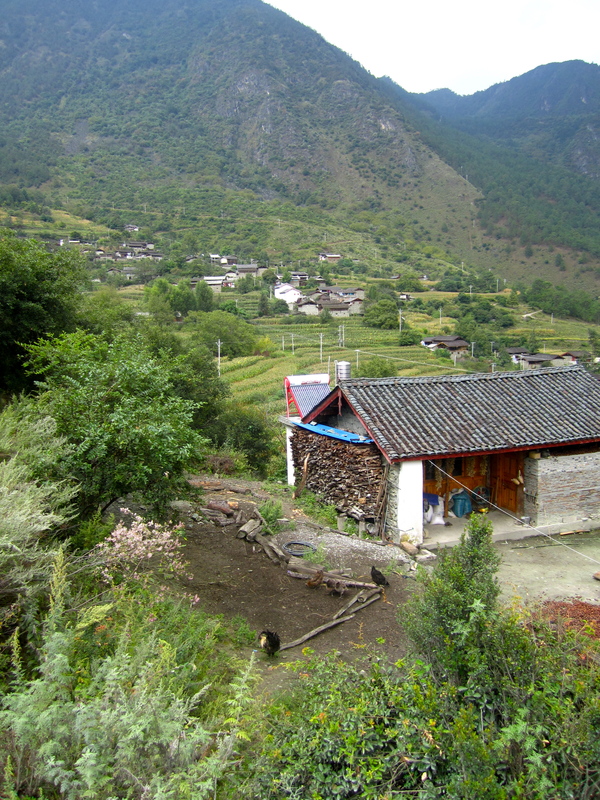 We passed through a few villages along the way. 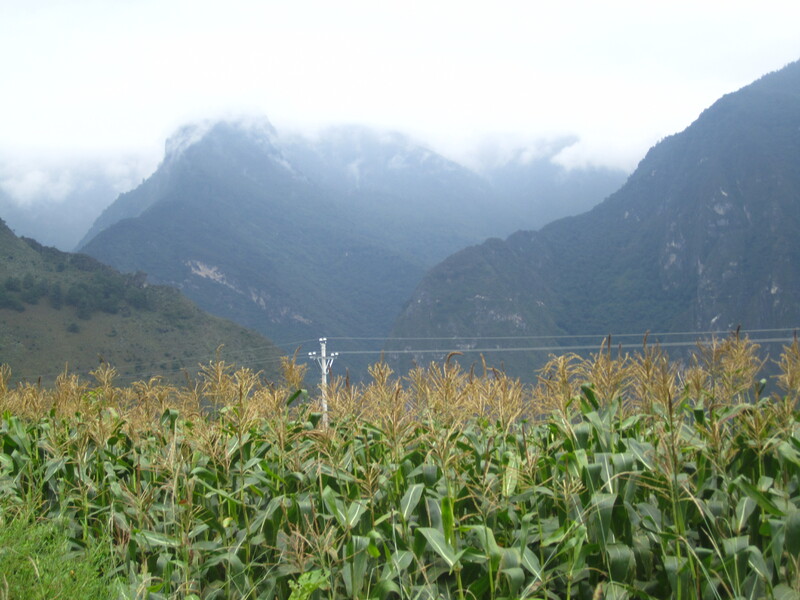 I loved all of the cornfields-- made me feel like I was back in PA for some reason. 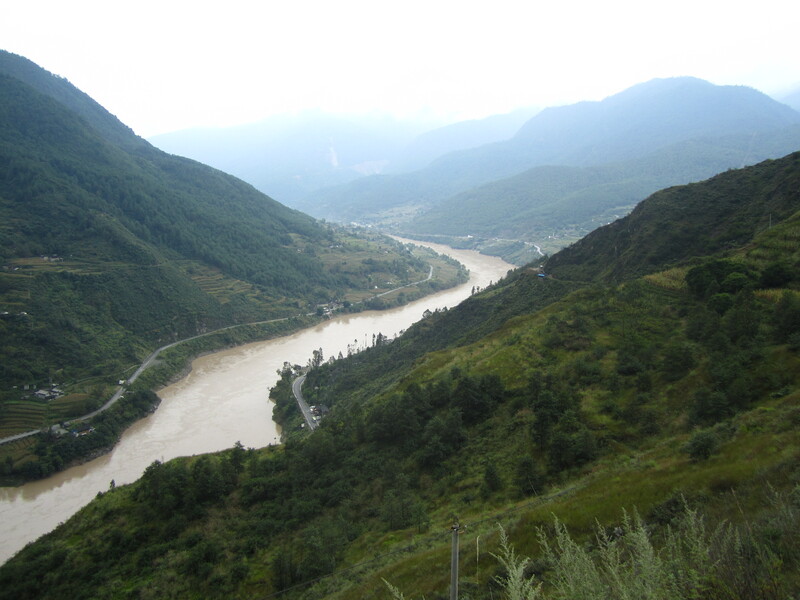 It was really nice to see natural beauty in China that isn't being destroyed or over-developed. We stayed at Tea Horse Hostel the first night, and stayed up late talking with the other teachers, as well as an American couple who were retired teachers turned Peace Corps volunteers in China. It got pretty chilly at night, but I stayed warm by drinking lots of hot water (which helped me rehydrate too!). The next morning Dan and I slept in to recuperate from our overnight bus ride the night before, and set out to conquer the second half of the trail at around 10:30 am. 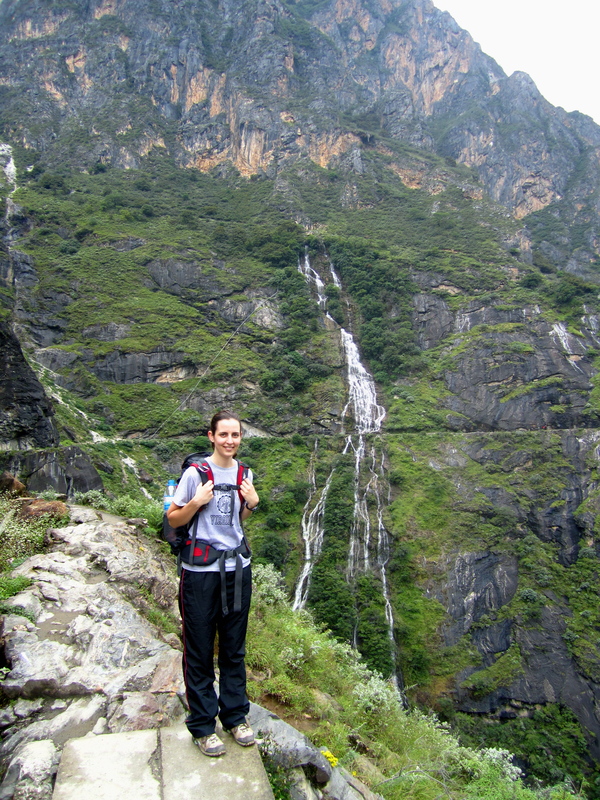 It was mostly downhill and had some of the best views of the hike, include a massively high waterfall. We made great time, and the second day of the hike only took us about three hours. There were several times when we got stuck behind some horses (the path wasn’t wide enough to pass them), but the Chinese cowboys did a pretty good job of keeping their horses under control. We saw one horse run off up the mountain, and the cowboy went scrambling after him and yelled at him to get back on the path. It was pretty cool. When we arrived at Sean’s Guesthouse in the Walnut Grove area at the end of the hike, we both just wanted to sit and read for a while, so that’s exactly what we did. 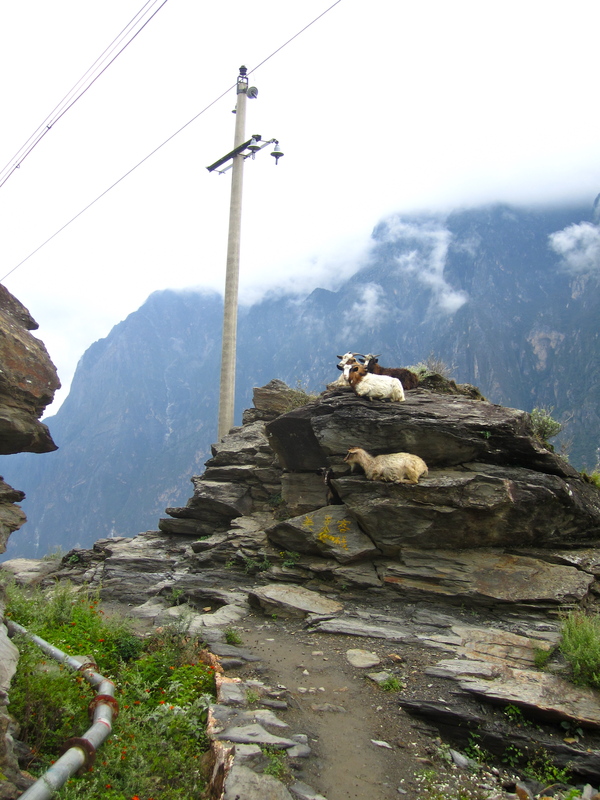 Eventually we wandered out along the road for dinner. We ate at a new Tibetan guesthouse down the road from Sean’s, and the food took about 45 minutes to come out, but it was totally worth the wait. Dan said it was his best meal in China yet, and it’s definitely in my top three favorite meals. We asked one of the owners what to order (always a good thing) and he recommended we try the yak cheese dish and some type of fried meatballs. 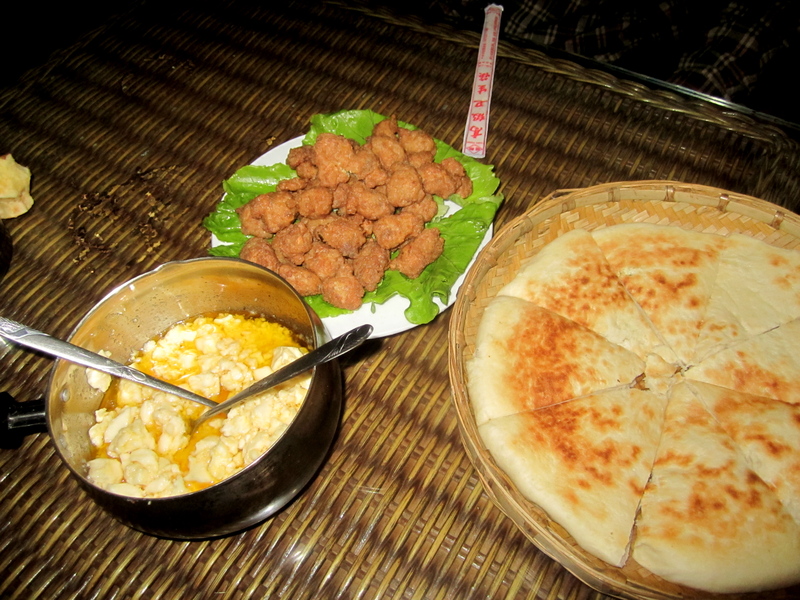 We also got some of the traditional flatbread (baba) that was chewy and warm and a welcome change from my usual starches: rice, noodles, rice, noodles. The cheese was kind of a cottage cheese-like texture that had honey (or something sweet) stirred in. It tasted great spooned onto the baba with one of the savory meatballs. Granted, we were pretty hungry, but the food was delicious and I highly recommend that anyone who does Tiger Leaping Gorge eat here. The friendly owner came to talk with us after we finished, and explained a little more about the food. She said that the Tibetan ingredients (yak milk etc) were hand carried by her mother from the village she was from, and the apples that they gave us as an appetizer (crisp, juicy and amazing!) were from her husband’s family’s house further up the mountain. This meal was hands down one of the highlights of the trip! The next morning we rented a car to go back to Qiaotou and caught a bus going back to Lijiang. The sun peaked out just as we were leaving. I'd love to go back and do some different trails in the area. The bus was packed, and I got the middle seat in the far back, next to a man who hadn’t changed his clothes in a month and another guy who kept falling asleep on my shoulder. The other treat was several men smoking cigarettes on the bus with the windows closed! This is not uncommon in China, but it never fails to make me fume. Thank goodness I had put some new music on my iPod. 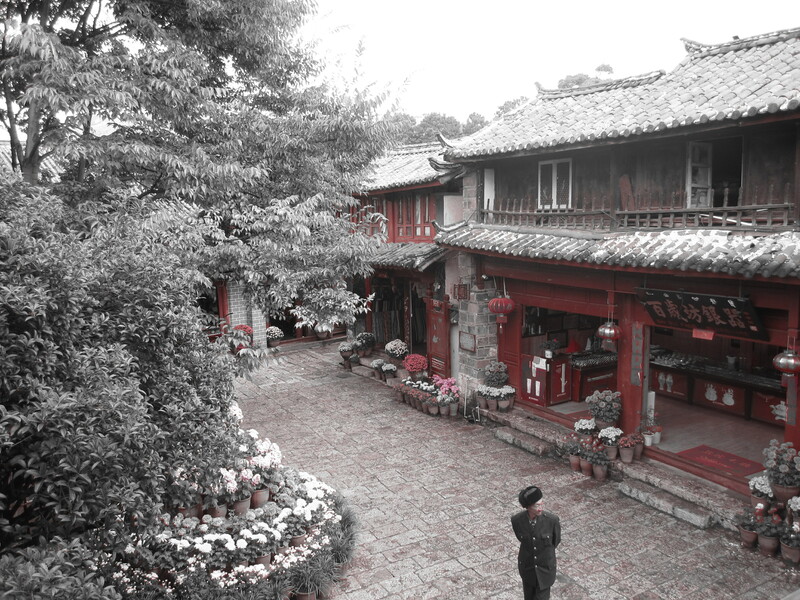 I was glad when we arrived in Lijiang and got to breathe some fresh air. We decided to spend the night in Shuhe, a town about 10 minutes from Lijiang, because the hostels were cheaper there and it promised to be less touristy than Lijiang. We were not dissapointed. Yes, it was extremely touristy- basically just row after row of shops and restaurants, men trying to sell you horse rides around town etc. But it was also very quaint with cafes featuring live music, winding alleyways, canals and cobblestone everywhere. 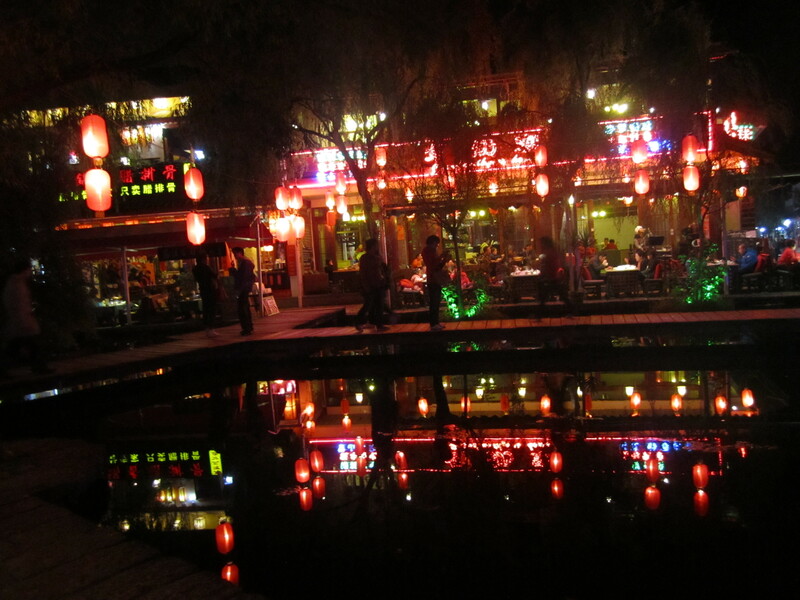 At night, all of the restaurants lit up red lanterns that reflected in the water. 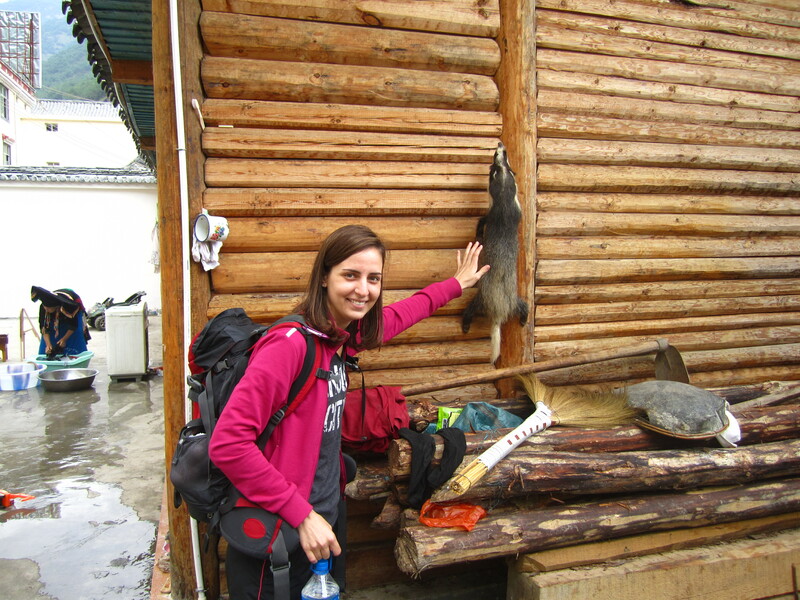 The next day we wandered around Lijiang, which was frustrating. I bought a map, but that only confused me more because it was oriented differently from the map in my guidebook, which was oriented differently from the maps posted around the city. It may be a UNESCO World Heritage site, but I think I’ve seen what I need to see of Lijiang, and I don’t need to go back. Dan left to go back to Kunming because he had to teach, but I stayed longer. I tried some Chinese snacks and walked around the Old Town a lot, but ended up happiest just sitting at a cafe, drinking Yunnan Coffee and reading my Kindle. Another interesting quirk was that every other store was playing the same song, which I later learned was Lijiang’s “theme song.” (Imagine that, the city has its own song!) It was fun to hear the first few times, but it quickly became very, very annoying. The other day on campus (in Kunming!!) I heard the song drifting out of a classroom… and almost lost it. As always, I was happy to get back home to my own bed, as well as catch up with my friends who had done other things over the holiday. 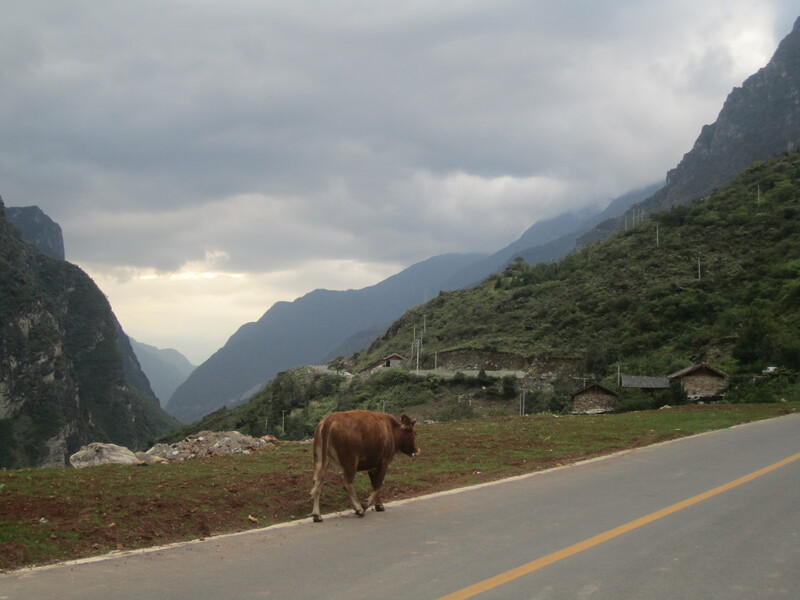 I’m looking forward to taking more weekend trips around Yunnan before it gets too cold, so stay tuned for more travel updates. What an interesting trip. So glad to hear you made it back home safe and sound. Will be waiting to hear of your next adventure. As always, awesome photos with wonderful explanations. It is really a treat to get your blog. We are off to Thailand & then Vietnam on Monday. I hope we get some good photos. I know we will have a super time. Beautiful pictures, and interesting traveling experience. I’ve heard of green eggs and ham, but never green rice! Thanks for the tour guide suggestions. Will wait for more Kim’s pointers.